The President’s team had months to prepare this signature immigration initiative. And they produced…an amateurish, politically self-immolating effort that humiliated the country, provoked international retaliation, and failed to withstand the obvious federal court challenge on its very first day. Given the despicable nature of this effort, I’m happy it has become a political fiasco. It also makes me wonder how the Trump administration will execute the basic functions of government. This astonishing failure reflects our new President’s contempt for the basic craft of government. Given the scope of the mess our amateur hour president and his flunkies – racist Bannon’s dirty fingerprints are all over the EO – have made, don’t you think that those Republicans who moaned and whined about Obama’s relatively modest executive orders might have something just a little harsh to say about what Mr. Trump has produced? And some do. Some can only manage to whimper a little about how it’s “too broad” or offer some other anodyne criticism. Some, however, like Pennsylvania’s Charlie Dent, have enough intestinal fortitude to make a reasonably strong statement condemning the nasty little exercise. He is doing what he told the American people he would do. I would not support a travel ban on Muslims; I do support increased vetting on people applying to travel from countries with extensive terrorist ties or activity. These seven countries meet that standard. Our top priority should be to keep Americans safe. Blunt just holds his nose and pretends that Muslim-baiting isn’t the real goal and he’s good to go. You gotta admit, this old boy knows who butters his bread. But is that greasy bread worth demonizing a few million Muslim Americans. Or turning one’s back on desperate people fleeing death and chaos? Especially when it was another bad American president, George W. Bush, who pushed Humpty Dumpty off the Middle Eastern wall. Don’t we owe these people something besides lies about the need for “very, very strict vetting” that are used to cover up the fact that President Orange Buffoon needs to fire up the bigots who voted for him? … Bannon wanted turmoil and condemnation. He wanted this executive order to get as much publicity as possible. He wanted the ACLU involved. He thinks this will be a PR win. [… ] Liberals think middle America will be appalled at Trump’s callousness. Bannon thinks middle America will be appalled that lefties and the elite media are taking the side of terrorists. After a week of skirmishes, this is finally a hill that both sides are willing to die for. Who’s going to win? 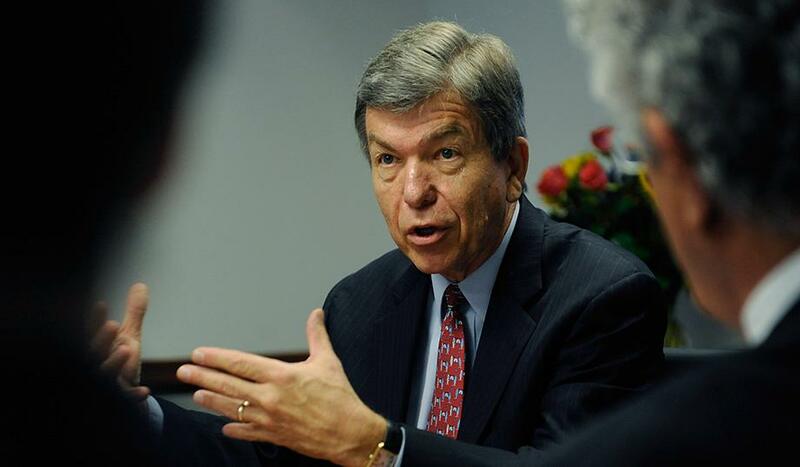 It’s pretty clear where Roy Blunt is putting his money.